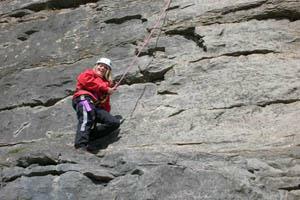 Rock Climbing at Nantyr Outdoor Education Centre Rock ClimbingNantyr is a residential outdoor education centre, situated in the beautiful Ceiriog valley 4 miles from Glyn Ceiriog. Located at the foot of the Berwyn Hills, the centre is ideally positioned to utilise the local area’s many wonderful outdoor locations and resources. Nantyr is a residential outdoor education centre, situated in the beautiful Ceiriog valley 4 miles from Glyn Ceiriog. From the village of Chirk take the road to Glyn Ceiriog, go through the village to the roundabout taking the second exit to Llanarmon, shortly after leaving Glyn Ceirog take the right hand turn to Nantyr. Follow the road for approximately 3 miles, do not turn off until you start to go down hill, at the bottom of the hill is a telephone kiosk and Chapel. Immediately opposite the kiosk is the entrance to Nantyr Outdoor Education Centre.